15. S. Motsch, C. Schütz, P. H. Huy,* “Systematic Evaluation of Sulfoxides as Catalysts in Nucleophilic Substitutions of Alcohols“, Eur. J. Org. Chem. 2018, 4541-4547 (doi: 10.1002/ejoc.201800907). Selected as very important paper. 14. T. Stach, J. Dräger, P. H. Huy,* „Nucleophilic Substitutions of Alcohols in High Catalytic Efficiency“, Org. Lett. 2018, 20, 2980-2983 (doi: 10.1021/acs.orglett.8b01023). Highlighted on organic-chemistry.org. 13. P. H. Huy,* I. Filbrich, „A General Catalytic Method for Nucleophilic Substitutions in High Cost- and Atom-Efficiency“ Chem. Eur. J. 2018, 24, 7410–7416 (doi: 10.1002/chem.201800588). Rated as hot paper. 12. P. H. Huy,* T. Hauch, I. Filbrich, "Lewis Base Catalyzed Nucleophilic Substitutions of Alcohols”, Synlett 2016, 27, 2631-2636; (doi: 10.1055/s-0036-1588633). 11. P. H. Huy,* S. Motsch, S. M. Kappler, "Formamide als Lewis-Basen-Katalysatoren in SN-Reaktionen: Effiziente Transformationen von Alkoholen zu Chloriden, Aminen und Ethern“, Angew. Chem. 2016, 128, 10300-10304 (doi: 10.1002/ange.201604921); “Formamides as Lewis Base Catalysts in SN-Reactions - Efficient Transformation of Alcohols into Chlorides, Amines and Ethers”, Angew. Chem. Int. Ed. 2016, 55, 10145-10149 (doi: 10.1002/anie.201604921). 10. P. H. Huy, I. Filbrich (Saarland University), “Method of converting alcohol to halide”, LU patent 2017/93108 (Priority date 2016, June 16th). 9. P. H. Huy (Saarland University), “Method of converting alcohol to halide”, WO patent 2016/202894 A1 (Priority date 2015, June 17st). 8. R. Opitz, M. Müller, C. Reuter, M. Barone, A. Soicke, Y. Roske, K. Piotukh, P. Huy, M. Beerbaum, B. Wiesner, M. Beyermann, P. Schmieder, C. Freund, R. Volkmer, H. Oschkinat, H.-G. Schmalz,* R. Kühne,* "A modular toolkit to inhibit proline-rich motif-mediated protein-protein interactions“, Proc. Natl. Acad. Sci. USA. 2015, 112, 5011-5016 (doi: https://doi.org/10.1073/pnas.1422054112). 7. 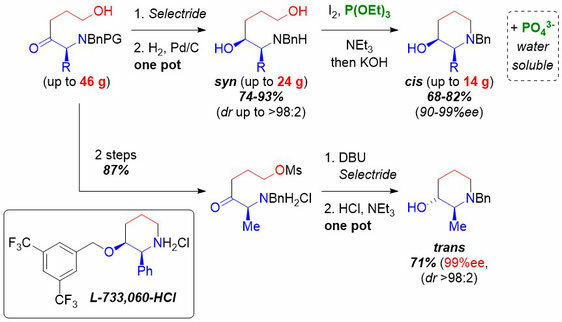 P. H. Huy,* J. Westphal, A. M. P. Koskinen,* "Concise, stereodivergent and highly stereoselective synthesis of cis- and trans-2-substituted 3-hydroxypiperidines – development of a phosphite-driven cyclodehydration”, Beilstein J. Org. Chem. 2014, 10, 369-383 (doi:10.3762/bjoc.10.35). 6. P. H. Huy,* A. M. P. Koskinen,* "Efficient, Stereodivergent Access to 3-Piperidinols by traceless P(OEt)3-Cyclodehydration”, Org. Lett. 2013, 15, 5178-5181 (doi 10.1021/ol4026588). 5. R. Kühne, H. Oschkinat, R. Opitz, M. Müller, H.-G. Schmalz, C. Reuter, P. Huy, "Structural mimetics of proline-rich peptides and use of the same“, WO patent 2013/030111 A1. 4. C. Reuter, P. Huy, J.-M. Neudörfel, R. Kühne, H.-G. Schmalz,* "Exercises in Pyrrolidine Chemistry: Gram Scale Synthesis of a Pro-Pro Dipeptide Mimetic with a Polyproline Type II Helix Conformation“, Chem. Eur. J. 2011, 17, 12037-12044 (doi: 10.1002/chem.201101704). 3. P. Huy, H.-G. Schmalz,* “Practical One-pot Double Functionalizations of Proline”, Synthesis 2011, 954-960 (doi: 10.1055/s-0030-1258428). 2. P. Huy, J.-M. Neudörfl, H.-G. Schmalz,* "A Practical Synthesis of trans-3-substituted Proline Derivatives through 1,4-Addition”, Org. Lett. 2011, 13, 216-219 (doi: 10.1021/ol102613z). 1. J. Zaminer, C. Brockmann, P. Huy, R. Opitz, C. Reuter, M. Beyermann, C. Freund, M. Müller, H. Oschkinat, R. Kühne,* H.-G. Schmalz,* „Adressierung von Protein-Protein-Wechselwirkungen durch niedermolekulare Verbindungen: ein Pro-Pro-Dipeptid-mimetikum mit PPII-Helixkonformation als Modul für die Synthese PRD-bindender Liganden” Angew. Chem. 2010, 122, 7265–7269; “Addressing Protein–Protein Interactions with Small Molecules: A Pro-Pro Dipeptide Mimic with a PPII Helix Conformation as a Module for the Synthesis of PRD-Binding Ligands“, Angew. Chem., Int. Ed. 2010, 49, 7111–7115 (doi: 10.1002/anie.20100173).